John was kind enough to make reservations for us at the Naples City Dock, and we arrived at 2:00 yesterday. John and Diane came over at 4:00 and we enjoyed drinks, appetizers, and conversation. After trying a couple really busy restaurants, we went back and had dinner at the City Dock restaurant. We were all pleased with what we ordered and the Key Lime Grouper was delicious. It was so much fun to see John and Diane again, and we hope to get together with them regularly now that they have a condo in Naples. We've been motoring all day in winds under 10 knots (haven't experienced that in quite a while) from behind us, with a little help from the main. It's getting us where we want to go, though - HOME! We should be docking at around 5:30. Saturday morning we found ourselves in a quandry: the tide had been rising since about 4:00 a.m., and with strong winds and big waves, we had serious concerns about being able to make it under the 65' Seven Mile Bridge. We quickly nixed the option of hanging around until high tide later in the afternoon, then decided to save ourselves the stress and go by way of Key West instead. I had been there twice - once on a cruise with Wayne and once on a cruise with my mom - but Wayne hadn't seen the town, having instead opted for a snorkeling trip when we stopped there. We wandered along the boardwalk in the historic seaport area and did the obligatory walk down Duvall Street to check out the sights and shops (although Wayne only went a couple blocks before returning to the boat to wash it down). We went to Mallory Square for sunset, of course, and enjoyed a leisurely drink and a bite to eat while waiting. After that, well... Key West... party town... spring break... Saturday night... Umm, not our scene. We were in bed by 9:00. Last night was another rolly one, anchored ten miles offshore, but we must be getting used to it because we had a pretty good night's sleep. Shortly before anchoring, a bird (some kind of small swallow, I think) joined us in the cockpit. He not only joined us, he bonded with us. A friend stopped by for awhile and they perched on our hands, chest, shoulders, neck - until Bird #2 finally left. While I was down below brushing Emma, our little bird fell asleep in Wayne's hand, tiny beak tucked under his wing. I brought up a dish of water, made him a shelter from the wind, and set him on a rope to perch for the night. This morning when we got up, our fine feathered friend was exactly where we left him, still sound asleep, oblivious to a couple of his friends flying around the boat that seemed to be looking for him. 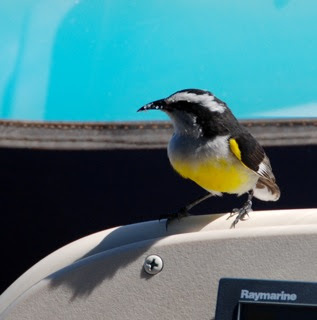 He woke up around sunrise (wondering, I'm sure, where the heck he was), perched near the companionway and looked around for awhile, then migrated to my neck before eventually flying off across the water. Tonight we will be at a marina in Naples. Our friends John and Diane (whom we visited in Vermilion, Ohio and met up with in Rock-something - land? port? - Massachusetts on our trip down in 2007) bought a condo in Naples last year and we're going to get together with them today; we sure look forward to seeing friends. This morning an anonymous voice on the VHF echoed the exact sentiment I expressed to Wayne yesterday: "Is anyone else out here getting tired of all this wind?" He was probably on a fishing vessel, and of course we're on a sailboat, but still... we've had so much wind for so many days that my whole being yearns for stillness. The reality of only getting off the boat twice in nine days compounds that yearning. The upside, naturally, is that we haven't needed to motor. And Lena Bea has been in her glory, like a wild mustang set free - this is what she was born for! The winds have been blowing at over 20 knots, sometimes topping out at 30. Although the direction hasn't been optimal (too much behind us), we've been riding the waves at the rate of 7-8 knots for nine consecutive days - ever since leaving Blackpoint on March 20. Along with the winds, we've experienced pretty big waves as well - some 6-8' - but at least we haven't had to sail into them. After we left Paradise Island on March 24 we anchored off Chub Cay for a night. The following night we anchored on the Banks of the Bahamas, with no land in sight, in big waves. Suffice it to say, we didn't sleep, but we did manage to stay in bed without getting thrown out! 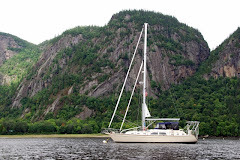 We wouldn't have chosen to anchor there in those conditions, but being so far from land our only other option was to sail through the night; I didn't want to cross the Gulf Stream alone at night in high winds and waves, so we just rode it out and napped the next day. We slept REALLY well the next night off Rodriguez Cay, however, and also while moored at Marathon the night after that. Whew! It was a relief to be back in Florida and have the worst (mentally, if not factually) of our passage-making behind us. We spent Thursday night anchored at Black Point, Friday and Saturday nights anchored at Big Majors, and last night at Hawksbill Cay. With a cool, brisk wind and choppy water, we didn't feel much like going anywhere in the dinghy. Except for a potluck dinner on the beach at Big Majors Friday night with half a dozen other boats (two couples from Minnesota) and happy hour aboard Surprise with Tom and Linda on Saturday, we stayed on the boat. Wayne got a few projects done, I organized some things and made bread and yogurt in preparation for the trip home, and we both read a lot. So suddenly we find ourselves back in Nassau - Paradise Island, actually. So many people told us we had to see Atlantis, the big resort and casino here, so we took a slip at their marina. They only allow boats that are a minimum of 40' long to stay here because this marina is mainly for mega-yachts; every slip is taken and Lena Bea feels dwarfed by her neighbors. It costs a whopping $4.50/foot to stay here, but that entitles us to use all the facilities that are available to hotel guests, including the beaches, swimming pools, water slides, and so on. We didn't do any of that, but we spent a couple hours exploring Atlantis's lagoons and aquariums. 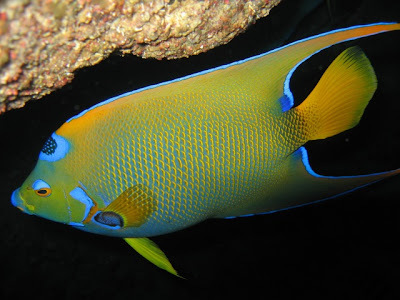 Atlantis boasts the largest man-made open air marine habitat in the world (141 acres) and has eleven exhibit lagoons inhabited by about 200 species, including dolphins, sharks, stingrays, sawfish, spiny lobster, turtles, manta rays, and many others. It is an impressive place and we're glad we stopped. 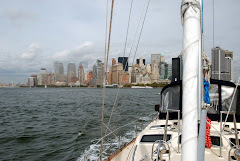 It was a great sailing day: comfortable, with E-NE winds that averaged 20 knots. We made good time and zipped along at about eight knots most of the day. Oh, and the barracuda we caught? Wayne recalculated and determined it was only 18". But you already knew that, didn't you? 3/19/09 - Return to Black Point, etc. Our stay in George Town was short, but with a front due this weekend through Wed. expected to bring winds of 25-30 knots, we decided to hustle on north. As always, we told ourselves we'll be back another time to catch all we missed on this trip. So we find ourselves back at Black Point, enjoying excellent wi-fi at Scorpio's - no two-for-one rum punches this time though...probably a good thing. Enjoyed good conversation with another IP cruiser. We're pathetic fisher-people. I haven't even mentioned that we occasionally - when crossing in deep water - throw out a hook, because it wasn't worth mentioning. Today a fish took our whole line and we didn't even notice until it was all gone. After Wayne reloaded (?) the reel, we were vigilant about keeping watch. 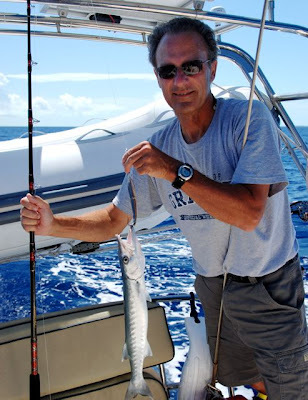 We finally hooked another fish - a 24" barracuda (I know it looks smaller, but Wayne measured it). Unfortunately for us, fortunately for our catch, they aren't good for eating, so we threw him back. I'm not sure where we'll end up tomorrow - I'm pushing for someplace near Pipe Creek - but we expect to make our way north at a rapid pace; we could be poised to cross to Florida by early next week. Of course, we'll await our weather window for as long as it takes. We don't know how the coming weather front will affect our plans, though - we may have to hunker down for a couple days. 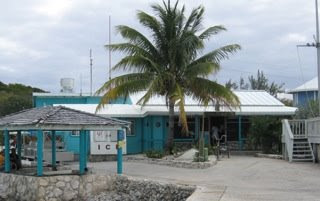 A few more things about George Town: For many cruisers, Elizabeth Harbor is the ultimate Bahamas destination because of its southern location and because George Town has more of everything a cruiser could ask for as far as services (airport, taxis, package delivery, car rental, boat stuff, hair salons, etc.) and provisions than any Bahamas town except Nassau. But more than that, George Town REALLY caters to the cruisers. Hundreds of cruisers call Elizabeth Harbor their winter home and return every year. 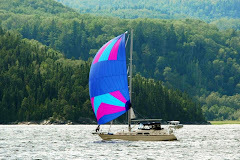 Every morning at 8 a.m. they have a cruisers' net on the VHF, where cruisers are informed about weather, hear advertising from local businesses, and share information on activities happening that day. Most of those activities take place on the beach, and include volleyball, yoga classes, Scrabble, dominoes, bridge games, beach parties, and so on... the list is endless. We arrived at the end of their annual Regatta week, and that evening they had a variety show. There were various activities for St. Patrick's Day, etc. As solo cruisers only there for a couple days, we didn't participate, but maybe next time we will stay longer and get into it more; I don't know. We like to socialize on a small scale, but don't go so much for large, organized group activities. What we did do in George Town: walked around town, went to the straw market, stopped at Exuma Markets for a few provisions. 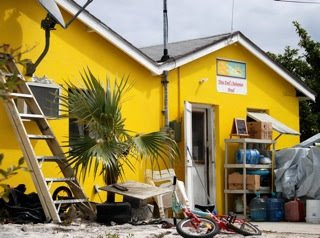 On Stocking Island (just across from GT): Visited Hamburger and Volleyball Beaches and had lunch (conchburgers) at Chat 'n' Chill. Crossed the island and walked along the gorgeous beach over there. The temp was hot and we regretted not having time to get in the water, especially since the snorkeling here is supposed to be fabulous. But... can't do it all and we're ok with that. 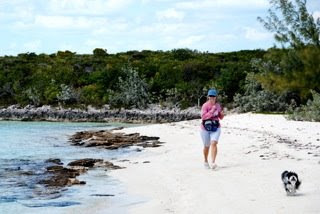 Next time we want to rent a car and explore all of Great Exuma Cay. First of all - Happy Birthday, Roberta! We send you our warmest thoughts and sunniest wishes for a dream-filled year. God bless you! Judging from the back room next to the restroom, they also sell office/stationery supplies. I also learned they sell real estate and offer van service. Wayne dropped me off and agreed to pick me up at 5:00, closing time (he's back at the boat). The proprietor had to go to the airport, so he locked me in (with the key left in the lock inside - I made sure). He said to lock the door and leave the key in the outdoor meter box when I leave. He failed to flip over the open/closed sign, so it still says they're open; sure hope no one comes to the door. 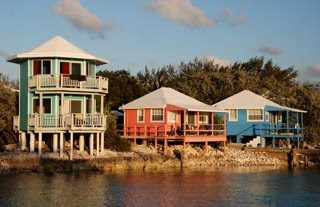 Great Exuma is the cay on which George Town is located. 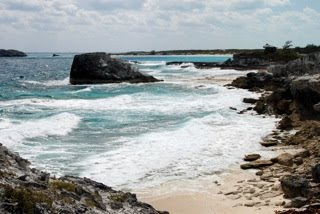 It's the largest (37 miles long) of the cays, and the only cay with any significant population. 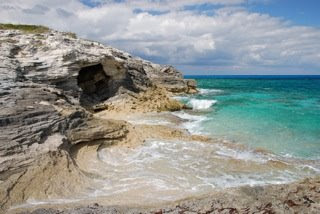 George Town itself has a permanent population of about 1000 people and is the capital of the Exumas; the Tropic of Cancer runs through the city. I apologize for not responding to those who have commented on the blog this past week; I've had very limited internet time. Wayne appreciated the birthday greetings, though, and has asked me to pass along his thanks. We can send email and blog posts via our satellite phone, but it takes a lot of time and patience - we keep losing our satellite connection and the data service is so slow that our messages don't get a chance to be sent or received before losing the signal. And it's far too slow to actually do anything on the blog, like edit messages, add photos, or respond to comments. We left Black Point on Saturday, anchored off Heddy's Land on Big Guana Saturday night, and Cave Cay Sunday night. For the past week our inclination has been to skip going to George Town - too many other boaters, too far away, etc. So I have no idea what got into us this morning that made us say, "Let's go to George Town today," especially since the winds would be on our nose. So we left at 10:00, and 6.5 hours later - here we are. We don't expect to spend more than 2-3 days, but at least we'll get a taste of it. From here we start to make our way north, and at a more rapid pace than we made our way south. We left our idyllic anchorage at Thomas Cay and anchored at Black Point on Thursday. 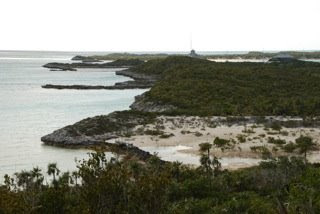 Black Point Settlement is the second largest settlement in the Exumas, after Georgetown. No marina here (yet), just lots of friendly people - and we love it. We ordered lunch and tried to get wi-fi at Lorraine's Cafe; we eventually got our lunch, but wi-fi was a bust. We did laundry for the first time since leaving Punta Gorda on February 5; we only did two loads, although a third was probably needed. 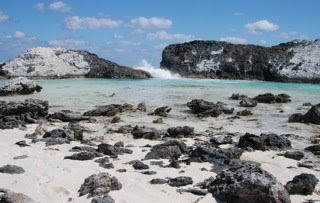 The general consensus among Bahamas cruisers is that Black Point has the best laundry facilities in the Exumas, if not the Bahamas. The facility has many machines, all modern, and costs $7/load to wash and dry. Just as we were heading into shore to do our laundry, we got a call from Butch and Gretchen (and their 5-year old son, Reese) on Lucidity; they were inviting us to join them and two other Island Packet couples - Michele and Steve on John Ray and Randy and Nicki on Kristinly - for happy hour. We scrambled to get our laundry done to make it over there on time. An interesting aside here: We've been in contact with many cruisers throughout the trip, many only via VHF radio (the cruisers' equivalent of telephone with a seemingly endless party line). We had talked to Butch on Lucidity a number of times and Wayne had met him once when we were in Marathon (he is also on the Island Packet email list that Wayne is on); it was as if we already knew him. He and a bunch of other boats crossed to the Bahamas the same day we did. Well, while we were at Lorraine's Cafe there was a couple there with a young child. The dad spent quite a while in the adjacent internet room and I went in and asked him for the password to get online. When he returned to the cafe and I realized he was with the woman and child, I wondered if it was Butch and family, but assumed that Wayne would have recognized him and said something. So when we got to his boat and realized it was the same family and that we had sorta already met in person, we had a good laugh. This is not an uncommon scenario. As we were approaching the anchorage yesterday, we crossed paths with Dues Paid (Betty and Leo from Punta Gorda). They radioed us and told us there were two other boats from Punta Gorda in the anchorage. One of them radioed us later on, and although it didn't work for us to get together with them, we could have easily met them at the dinghy dock, the laundromat, Lorraine's, Scorpion's, etc., without knowing it. A couple days ago a call went out on the radio requesting volunteers to help tutor students at the all-ages school in Black Point. Wayne and I both knew we wanted to serve, so we, along with Michele on John Ray, were there from 9:00-12:00 to help as needed. Wayne tutored a 4th grade student, Ricky, and I tutored a first-grader, Leon. It felt strange to have to be somewhere at 9:00 this morning (or anywhere at any time), but we managed it just fine. The time spent with the kids was a sweet change of pace and a real joy. There are 43 students at the school; one of the teachers only has a fourth grade education. We also enjoyed visiting with the head volunteers, Sharon and Charles, who have been doing this for ten years. They volunteer in Black Point for about four months a year and spend the rest of the year in their RV visiting four children and nine grandchildren who live in four different states from Michigan to Florida. In addition to the work they do at the school, they lead adult Bible studies and do work at their church (their primary calling here). Sharon and Charles are an amazing couple. The two school custodians (another Sharon and a woman whose name escapes me), were busy making jewelry and other crafts from shells in the room where I was tutoring Leon. They (along with the other Sharon) have been taking a shell-crafting class for 10-days, three hours a day. After passing the class, these women will receive a certificate that will help them get a small business loan if they decide to craft shells for a living. Sharon had made some lovely jewelry with shells and sea glass, and the other woman was crafting a lamp from a conch shell. One of their biggest obstacles in doing their craft is finding time to look for shells. Well, they don't call me Shelley for nothing! The ladies were delighted when I returned in the afternoon with shells and divided tackle boxes to sort and keep them in. They shared with me their knowledge of how to clean the shells using supplies like muriatic acid and alum, toilet bowl cleaner, and wax paper. That evening at 7:00 we returned to the school to see the works of the students on their final night of class. We heard that Scorpio's bar and restaurant had better wi-fi service than Lorraine's, PLUS they have happy hour two-for-one rum punches with complimentary snacks. Any time I can get free wi-fi is happy hour as far as I'm concerned, so the rum punches were icing on the cake. Michele from John Ray joined me at the table with her computer while Wayne went to visit with the guys at the bar. Michele and I had a nice visit, which proved to be a far better use of my time after three rum punches than trying to focus on writing a blog update. It was 7:30 by the time we left the school and Wayne suggested we stop by Lorraine's to see if she could squeeze us in for dinner. But of course! Lorraine had only limited options for us at that late hour and with no advance reservations, but we didn't leave hungry. Lorraine's mom bakes wonderful bread and is famous in the cruising community for her coconut bread, so of course we had to buy a loaf. After spending days with a significant number of other cruisers, we were ready for some solitude, but where? 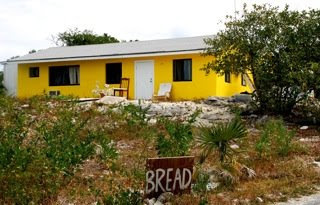 It's a commodity that's surprisingly hard to come by, even in the Exumas. 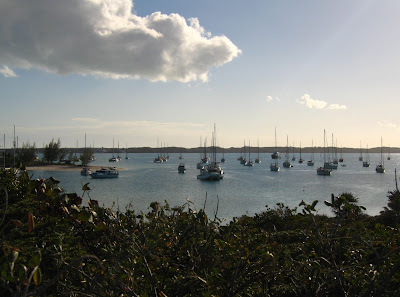 We settled on a somewhat tricky anchorage that Pat and Don had recommended - on the west side of Thomas Cay in Pipe Creek, with only one other sailboat nearby. It was a delicious break. 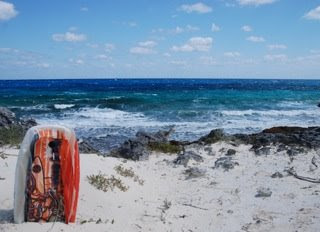 Temperatures were warm, winds were relatively calm, skies were mostly sunny, and waters (when timed around a swift current) were gentle - near-perfect conditions that meshed with our plan to spend time in the water, snorkeling and shelling. We didn't post to the blog, didn't take any photos, didn't talk to anyone on the VHF, didn't take any ambitious hikes, and didn't share happy hour with anyone but each other. The shelling was nothing short of magical, and I don't know if I can even describe it. That mental picture you probably have of walking along a white, sandy, beach, picking up an occasional shell - scratch it. 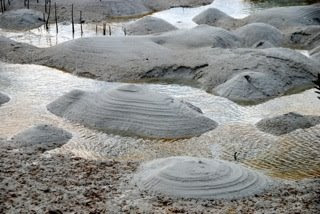 Imagine long expanses of sandy islands exposed by the receding tide, all previous footprints obliviated by the sea. Imagine sand dollars and sea biscuits scattered everywhere, many half-buried in sand - I felt like a kid at an Easter egg hunt. Imagine treasure hunting - and finding a 6-inch King Helmet shell... and five 4" ones. A 4" cowrie...perfection. All this experienced as sunset approaches and the tide rises, forcing us to wade knee-deep to our dinghy long before we are ready to leave. Thanks to Pat and Don for sharing their favorite spot with us. 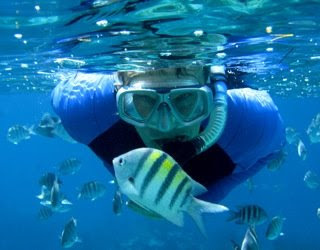 The snorkeling was marvelous as well. Wayne got his birthday wish yesterday: for the skies to clear enough to have sunlight in Thunderball Grotto. Our cruising guide says that to snorkel here is mandatory; all we can add to that is an exclamation point. Snorkeling these caves, with sunlight streaming in and illuminating countless beautiful fish and a dramatic underground landscape, was spectacular. We brought corn to feed the fish this time and boy, did they go wild! They actually bit open the Ziploc bag that I had my corn in. I saw and photographed a lionfish: The lionfish is an invasive species which is native to the tropical Pacific and Indian Oceans and has few natural enemies to help control it in the Atlantic Ocean. It poses a major threat here to coral reefs - a new study has found that within a short period after the entry of lionfish into an area, the survival of other reef fishes is slashed by about 80 percent. 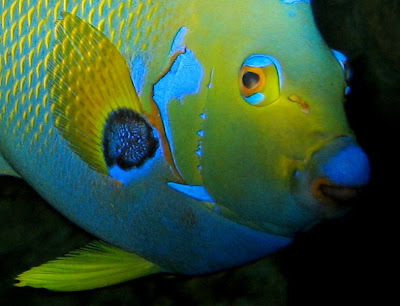 They are carnivores that can eat other fish up to two-thirds their own length, while they are protected from other predators by long, poisonous spines. 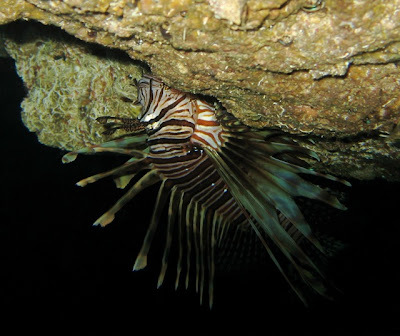 Lionfish are venomous; a sting from a lionfish is extremely painful to humans and can cause nausea and breathing difficulties, but is rarely fatal. Wanted posters of lionfish are posted throughout the Bahamas and anyone who sees one is encouraged to report it. I reported my sighting to Judy at Exuma Park. I hope she followed through because Thunderball Grotto is a popular destination for snorkelers, and I would hate for someone to be stung. We grilled steaks and I made ice cream and brownies for Wayne's birthday dinner. 3/8/09 - Happy Birthday, Captain Wayne! 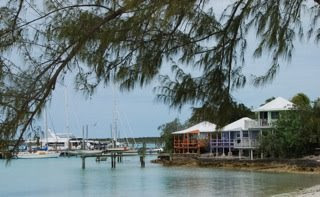 Saturday we took a slip at Staniel Cay Yacht Club, one of only two sailboats docked here with many power yachts. We walked around "town," and eventually made our way to Isles General Store, hoping to find ice cream. No one was minding the store, so we waited awhile, then headed back. Just down the road there were men rebuilding a bridge, with more men standing around watching, seemingly oblivious to the fact that we wanted to pass. As we politely started to elbow our way through, one of the bridge workers asked if we wanted something from the store and motioned to us to follow him back there. He unlocked the door to let us and another customer in, then disappeared. We didn't find anything irresistible anyway, so we left. We knew where we COULD find something irresistible: the "bakery." On our way up we chatted with a couple who had just bought some gorgeous, freshly baked cinnamon rolls. We found the roughly-hewn plywood sign that said "bread" on the corner next to a yellow house and figured this must be it. And indeed it was! We were tempted by the last loaf of coconut bread, but not much. We each walked out with two cinnamon rolls (they were small! ), quite happy to have not found ice cream. On our way back to the boat, we stopped and talked with Ray, owner of Staniel Cay Divers. He lives here on his boat with wife, Michele, a 24-year old son, and an 18-month old son. Ray is from Arizona (originally Iowa) and Michele is from California; he's a paramedic and she's a nurse. In 2004 Ray accepted a job in St. Johns, BVI, but they only got as far as the Exumas and have been here ever since. They started the dive operation last summer and have their son and one or two others working for them. We thought about going diving, but at $180 per person, decided to skip it. Ray is a really nice guy, though, all safety-minded with his paramedic training, and he has one of the nicer dive boats we've been on. It's easy to remember their names because mine is Michele Rae. We went up to the yacht club for happy hour to take advantage of drink specials and complimentary appetizers. They also had live entertainment - Ray and his son are in the band. Because today is Wayne's birthday, we made reservations for dinner. They have one seating at 7:00 and you must put your order in by 5:00. Wayne and I shared a cracked conch dinner, served with conch chowder, fresh bread, coleslaw, potatoes, beans, and strawberry cheesecake or apple pie for dessert. $28 for everything, including gratuity. We were glad that we shared it. We're headed back to anchor at Big Majors when I finish here; this afternoon we will snorkel at Thunderball Grotto, a spectacular skylit underwater cave that was featured in the James Bond movie of the same name. 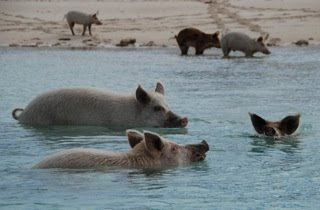 Big Majors is a cay known for its resident pigs, and sure enough, there were half a dozen of them sleeping on the beach as we approached in the dinghy this morning. 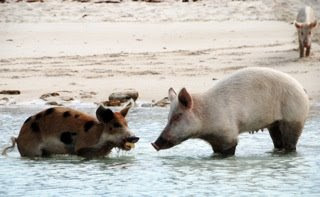 It didn't take them long to realize we were headed their way and might be bringing breakfast, so they lumbered to their feet and made their way down to the water. I lobbed them part of an over-ripe apple and within seconds they were in the water headed in our direction. We kept throwing them pieces of apple, trying to make sure everyone got at least one piece. 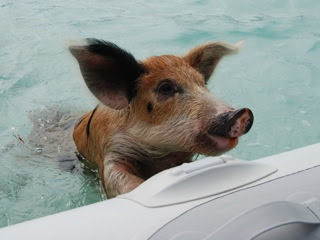 A couple of the pigs actually tried to climb in the dinghy! And yes! Some of them were actually swimming! It was a hoot. Did I mention that Compass Cay has pet sharks at the marina? 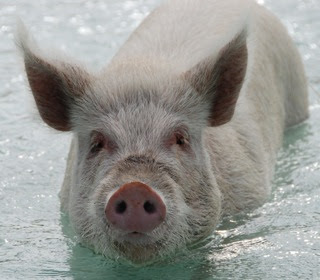 And people swim with them? Mom, you'll be happy to know that I kept my promise and didn't go in. 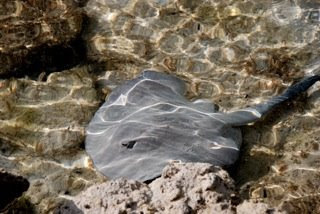 One of the best things about Compass Cay? They recycle, so we were able to dispose of all the cans we had accumulated for the past month, as well as trash that had been piling up since Nassau. And they didn't charge us extra! Many places charge $2-$5 to dispose of a bag of trash. Of course, we paid $2.50/foot dock fee; electricity would have cost an additional $25-$35/day and water was $.50/gallon, had we used them. 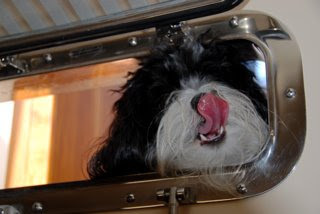 We so appreciate the self-sufficiency afforded us by having a generator and water maker. For those who don't know, a water maker removes salt from the sea water and filters it with a reverse osmosis system, so we never have to worry about having good, fresh water. The marinas here usually charge for water. There are places where you can get free water, but not at the marinas, which means you need to schlepp it some distance using containers. Many cruisers we've talked to didn't have water makers on their first trip to the Bahamas, but were quick to install one before they returned; Wayne installed one right before we left. We left Compass Cay early Thursday afternoon, and with strong winds from the east, sought protection at the anchorage on the west side of Big Majors - along with 40 other vessels (Wayne actually counted them). I wanted to do some shelling today, but didn't want to venture out too far because of the wind, so we went to Sandy Cay, about 1.5-2 miles west of here. It looked promising, with a gorgeous sandy beach. I didn't find much (even with snorkel gear), but it was a lovely spot and I enjoyed the day. Wayne isn't into shelling, so he amused himself watching the kite surfers who chose OUR beach to do their thing. It was a group of four young people who are the crew of a yacht anchored near us; they are moving the boat for the owner and had the opportunity to enjoy a day off. 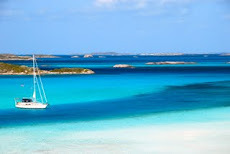 We left Warderick Wells Tuesday morning and picked up a mooring at Cambridge Cay, still in the Exuma Land and Sea Park. Chilly winds threatened to thwart our plans for a snorkeling excursion to the Sea Aquarium (not a real aquarium, just the name of the area), but we're tough! We're from Minnesota! 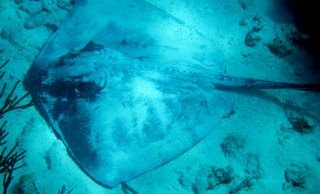 Our grit and determination rewarded us with the best snorkeling we've had in the Bahamas so far. We were befuddled at the enthusiastic reception given us by the fish - they swarmed us as soon as we entered the water - until we remembered that they expect visitors to bring food. It was a long, CHILLY dinghy ride back to Lena Bea in our cold, wet dive skins. 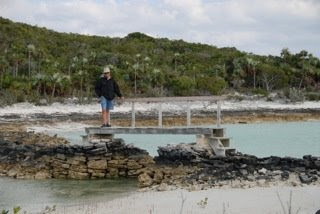 Considering the weather, we decided to move on to Compass Cay. There isn't much to do on land at Cambridge Cay and I'm not going in the water again until it warms up. Our volunteer mooring hosts at Cambridge Cay, Alena and Rick on Movin' On, saved us a couple hours by showing us how we could take a direct route to Compass Cay even though the charts show that the water is too shallow. Alena and Rick call the Bahamas home; they volunteer in the park for about four months a year and spend the rest of the year cruising. Compass Cay is a beautiful spot! Some say it's the prettiest cay in the Bahamas, and we cannot disagree with that. The marina is small, friendly, and personal, and the island is fabulous. Wayne and I decided to forgo a highly recommended trip to Rachel's Bubble Bath on the northern tip of the island because of the weather. Instead, we went for a 3-hour hike on marked trails that took us to Crescent Beach, then south and west along the shore. We walked across the "low tide airport," climbed the rocky cliffs along the shore, followed the trail along more beaches and through the island back to the marina. The scenery was breathtaking and we enjoyed the lack of monotony. Definitely the most interesting and scenic hike so far. Of course, photos don't begin to do it justice: We were here with some important people in the cruising world - Monty and Sara Lewis, authors of the Explorer Chartbook that is our bible for cruising the Bahamas. They are onboard their trawler, Saranade and had been at Compass for five days or a week, waiting for boat parts to make a repair. 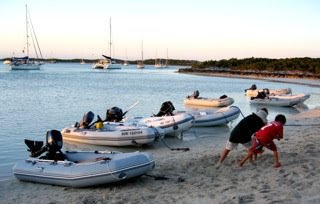 While we were chatting with Sara, Monty and the friend who got them the boat parts arrived in the dinghy. They had made their repair and left by the time we returned from our hike. We're enjoying a lazy Sunday morning at Warderick Wells, where we have decided to stay while an unfavorable weather front moves through. 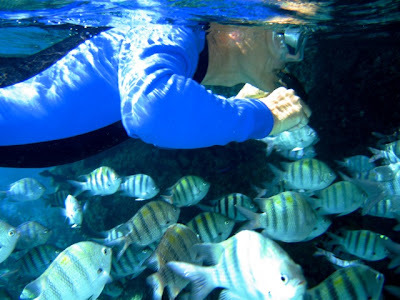 The protection here is good, and though the snorkeling won't be, there are more hiking trails to check out. It's warm today but colder weather is supposed to move in for most of the week; we can certainly deal with that. We welcomed the shower that blew through about 5:00 this morning; the boat needed a washdown. Yesterday as we prepared to go snorkeling, an incoming sailboat got stuck in the sand nearby. Wayne donned his Superman cape, jumped in the dinghy, and went to help them out. He successfully dislodged the vessel, saving the park from having to send a boat out. The Coast Guard Auxilliary would have been proud. 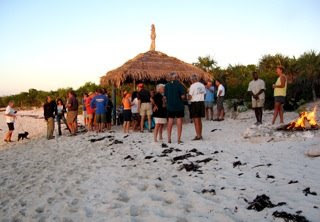 Last night, as is the custom at Warderick Wells every Saturday night, we celebrated happy hour on the beach. Everyone brings their drinks and an appetizer to share; it's a nice way to get acquainted with other cruisers. I spent some time visiting with Lynn and Ken on Silverheels III; they're from Toronto and have lived on their boat for four years - including winters on their shrink-wrapped boat in Toronto! They have no other home. 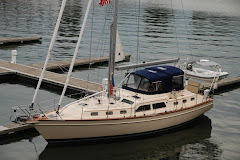 Many of you back home in MN would be surprised to learn how many people live on their boats. The simplicity of that lifestyle intrigues us, but cutting ourselves off from family and friends to that extent is not an option for us. We returned to the boat, too tired to stick around for music around the campfire. I think most of the older folks left about the same time we did. 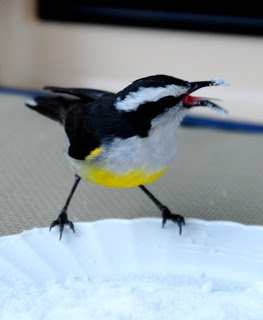 The bananaquits come by daily for their sugar fixes. I have a plate of sugar in the cockpit and they stop and help themselves. 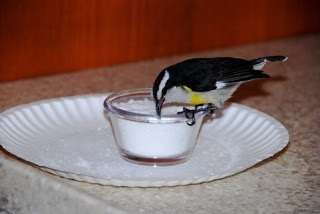 The bananaquits are very tame; a week or so ago we found one in the cabin after we returned from an outing. 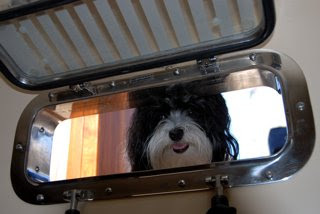 We got her out of the boat, but she hung around for quite awhile (that was before we learned she was looking for sugar). Friendly little things. P.S. The morning after I posted this, we found a bananaquit in the galley, helping herself to the sugar I was too slow to put back out in the cockpit: Wayne just asked where I want to hike to today; we'll see how ambitious I feel. They call this "the causeway;" it's not what I pictured when I saw it on the map. 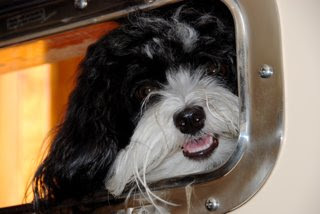 I like to watch Mom from the cockpit when she's working in the galley. Hi Mom! What's cookin'? Something smells mighty good down there.